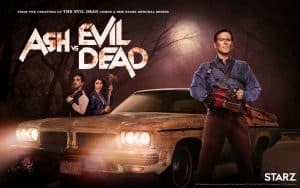 I was privileged to see the first episode of Ash vs Evil Dead at SDCC this year. The episode was introduced by Bruce Campbell himself with a warning to all adults that the gore in the show was pretend. A warning i which he said was necessary because some parents in the audience had brought their children. We were guilty of this as Little Bruce (my friend’s son) was dressed in his Ash costume sitting next to me, ready for the episode to begin. The episode starts with a reminder of how season one ended, with the three main characters headed to sunny Jacksonville based on a truce Ashe made with Ruby. Ruby had promised to leave Ash, Pablo and Kelly alone, in return for them allowing her to leave with the Book of the Dead. Season two begins by showing that Ruby has lost control of her children. This scene is beautiful: the children have grown, the background is creepy, and of course there is a nice bloody corpse on the table. Ruby, realizing she is in trouble, calls upon the only one who can help her -Ash! Ash is living it up and partying in Jacksonville with Pablo and Kelly. Ash is up to his usual style of being the center of attention, drinking, and working on the local ladies to get a little bit (or maybe a lot) of lovin. Ash’s luck never lasts and soon he learns that the truce with Ruby has been broken when a demonite attacks. And who turns into a demonite? Well Ash’s two current conquests of course, a mother/daughter duo. This bar scene does not disappoint with action, gore, and one liners. The gang is back in action. After realizing that the truce has been broken, they realize that they need to find Ruby. From a rhyme chanted by one of the demonites, Ash surmises that Ruby is in his hometown of Elk Grove, Michigan. The Oldsmobile Delta is gassed up and ready to go! Back on the road, we quickly learn that Pablo’s hand is possessed. All I can say is YES! The possessed hand is an all time favorite from Evil Dead 2 and I can’t wait to see the creative way they tell this story line. I mean let’s face it, only one man can have a chainsaw for a hand, so they must have something else in store for Pablo, maybe a screwdriver, given his mechanical skills? I never knew how much I wanted to know about Ash’s home town until we found ourselves following Ash to his childhood home, where Kelly not so subtly shows Ash she pities him. While Ash claims his parents are dead we quickly find him face-to-gun with his father. I don’t know who cast Lee Majors as Brock Williams, Ash’s father, but they couldn’t have casted better. This scene is amazing: it’s exactly how I would expect Ash’s father to act and they do a great job of showing the relationship between the two. 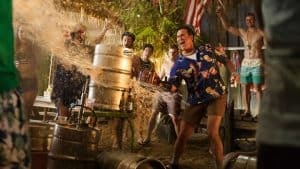 This scene is the first glimpse of what it was like for Ash to come back after fighting his friends turned demonites at the cabin and traveling through time (Evil Dead II and Army of Darkness). If your child came to you after having been missing and said that he chopped up his friends because they were possessed, would you believe them and support them in public? If you were that child, could you forgive your parents for not supporting you after going through something like that? For Ash and his father the answer is no to both questions. I hope we get to look into this relationship further. Outside a local bar, we find that Pablo is still connected to this evil in a way that has not been made clear to us before. As he sees the writing on a homeless man sign change into a drawing of a creepy face. Clearly, wearing the mask from the Necronomicon has left Pablo open to evil and/or premonitions. Inside the bar, we get a further look into Ash’s past as he encounters an old flame who has married the local Sheriff who was bullied by Ash as a child. The Sheriff is clearly still mad at Ash and takes this opportunity to embarrass him in front of the bar’s patrons. He announces that Ashs went crazy and chopped up his friends, calling him Ashy Slashy (I love the nick name). Ash’s reply is my favorite line of the episode. “Okay, that’s not true, I did not go crazy, I knew exactly what I was doing when I chopped up my friends.” Once again Ash’s warnings go ignored and the whole bar laughs at him. Meanwhile, Pablo is lured into an alley by Ruby, where he sees a vision of her and the Necronomicon is slammed onto his face. He rips it off with flesh going everywhere, exposing his skull. This scene reminds me of the cover from the movie Dead Alive, which to me adds to my enjoyment of the scene. It also reminded me of the scene where the guy rips off his face in Poltergeist… which was also a vision/hallucination. This is how we learn that Ruby is at the local crematorium. Pablo finally accepts that something is happening to him and he shares this with the group. I love the idea of having to go to the crematorium. It is the perfect setting for a horror show: it’s dark, creepy, and feels like they are in a maze. I also appreciate that they split up. Who wants to stick together in a creepy old building where evil is around the corner? Ruby’s children are quick to play games with the gang by pretending to be Ash’s shadow. Kelly fights herself, and Pablo goes face to face, no illusions involved. In this battle we learn a something important: Pablo’s amulet protects him from Ruby’s children, preventing them from seeing him, although we are not clear on how which factor work, he was definitely holding on to it in that moment. Once Ash finds Ruby, it’s clear that she has lost control and is even willing to go as far as killing one of her own children. Still I can’t help but wonder, can we trust her? Has she truly seen the error in her ways? No, not at all. She still wants to rule the world, but she needs to put down her ‘children’ first and needs Ash’s help for that. It’s a temporary alliance at best. Also, what do the children want with the Necronomicon? Do they know how to invoke the full power of the book? These are all questions I look forward to seeing answered in season two. Call me crazy, but I don’t think Ash will be back in Jacksonville by Friday. Note from the Editors: We are embarking into some exciting projects and will be providing espisode recaps for a few of our favorite shows. NCDS will be providing recaps for Ash vs. Evil Dead. We are excited to provide this content to our readers and hopefully we will add more to the list down the road.